Winter ecology is little studied in the Arctic. Certainly, the environment is harsh, cold, and dark, hardly conducive to activity. There are three strategies to outlast the Arctic winter: leave (migration), freeze (most plants and terrestrial invertebrates) or hibernate, or stay active (most vertebrates, deep aquatic, and marine invertebrates) (see Adaptation). Most so-called Arctic birds are fair-weather visitors: they leave as autumn and winter approach. Some birds, such as ptarmigan, are resident in the Arctic all winter. 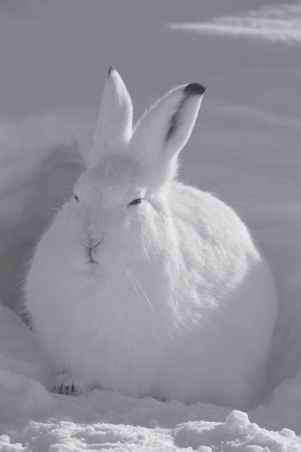 They seek shelter under the snow from time to time and in stormy weather, but otherwise forage for food all winter. During the summer, they accumulate body fat, which assists with overwintering survival. Small mammals may build winter nests of grass or find other protection and remain relatively inactive over winter. They, like the truly hibernating Arctic ground squirrel, accumulate body fat from summer feeding as reserves of winter energy. Polar bears, especially the pregnant females, also fatten up from autumnal feeding on seals, and then find winter dens where the young are born and suckled in their first months of life, before the mother emerges from the den. Muskoxen, caribou, wolves, and marine mammals are active all winter. They may restrict the places in which they forage (e.g., whales to polynya; seals to within range of their aglus) or they may range widely in search of grazing lands. In winter, muskoxen and caribou may cross wide stretches of sea ice to move from island to island, presumably in search of food. In the ocean, the same array of overwintering and foraging strategies probably applies to fish and invertebrates. Terrestrial insects and plants freeze solid for the winter. As autumn approaches, these organisms prepare by dehydrating and synthesizing antifreezes and biochem-icals that reduce the cellular damage caused by freezing. Even the frogs that overwinter frozen (e.g., in the Arctic, the wood frog Rana sylvatica; see Amphibians) go through similar physiological preparations. Body antifreezes are also found in fish that live in water at subzero temperatures in the Antarctic. Insects may overwinter at various stages of development. Mosquitoes overwinter as eggs, various butterflies and moths as caterpillars, and bumblebees as adult, mated queens. Generally, they seek some sort of shelter prior to entering the overwintering state. The shelter selected by woolly bear caterpillars is a place that is sheltered from high wind, but where snow will not become deep. Thus, when the early summer sun melts the snow, it soon warms the caterpillar. Most plants spend the winter with leaves intact, some (such as purple saxifrage and various willows) even with flower buds ready but frozen to pop in the first days of the active season. A few plants (e.g., Arctic poppy, various louseworts) lose their leaves, yet the stemlike top of the root remains, ready to sprout, just at ground level. There are few Arctic plants that are annuals and so overwinter strictly as seeds. It is probable that the seeds of most species can survive winter. Biennials and monocarpic perennials (i.e., are perennial, but flower only once and die) probably overwinter as seeds, but, like some other plants, may overwinter as tiny seedlings.